More than a million smokers are admitted to NHS hospitals every year. PHE chief executive Duncan Selbie said it was not about "forcing people" to quit, but was about "helping people". A recent report by the British Thoracic Society said 25% of hospital patients were recorded as being "current smokers" - which is higher than rates in the general adult population (19%). The survey saw 14,750 patient records submitted from 146 institutions across the UK. The report said the execution of national standards in smoking cessation were "woefully lacking" within the NHS and that there was "much to do to improve smoking cessation treatment for patients in hospitals across the UK". Its authors called for support for smokers in hospital by referring them to specialised help to quit, improving the prescription of nicotine replacement therapy, and investing in staff across all hospitals dedicated to helping people stop smoking. Mr Selbie said the plan was to give smokers who want to quit the right kind of support. "This isn't about forcing people. This is about helping people. And seven out of 10 say they want to quit. "So it's the chance when they're in the hospital to get them in touch with people who can help. And we know if you get that help, you're four times more likely to quit forever." According to PHE, smoking causes 96,000 deaths a year in the UK, and for each of those deaths, about 20 smokers are suffering from a smoking-related disease. About 475,000 hospital admissions in England were attributable to smoking in 2014-15, and the annual cost is estimated at £2bn, with a further £1.1bn in social care costs. 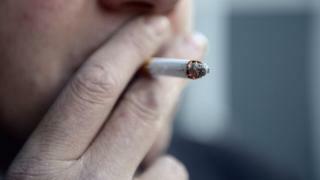 Smoking in hospitals grounds is already banned by law in Northern Ireland and Scotland. Legislation is earmarked for potential introduction in Wales later this year. The Department of Health in England says it has no plans to make it illegal at the moment. Dr Frank Ryan, a consultant psychologist at the Camden and Islington NHS Foundation Trust, said more people had to be encouraged not to smoke. "It's really about refocusing our efforts and motivating our service users and staff to quit. "And of course, whatever investment we make in smoking cessation programmes, there's a payback many times more in terms of the health benefits and even factors such as attendance at work, because it's workers who smoke [who] tend to have more absent spells from work." But Simon Clark, director of the smokers' group Forest, said banning smoking on hospital grounds would be a "gross over-reaction". "The impact on public health will be minimal because smoking in the open air is no threat to anyone else's health. "The reality is that hospitals can be stressful places for patients, visitors and staff. Instead of campaigning for a tobacco-free environment Public Health England should show some compassion for the many people for whom smoking is a comfort at a difficult time."